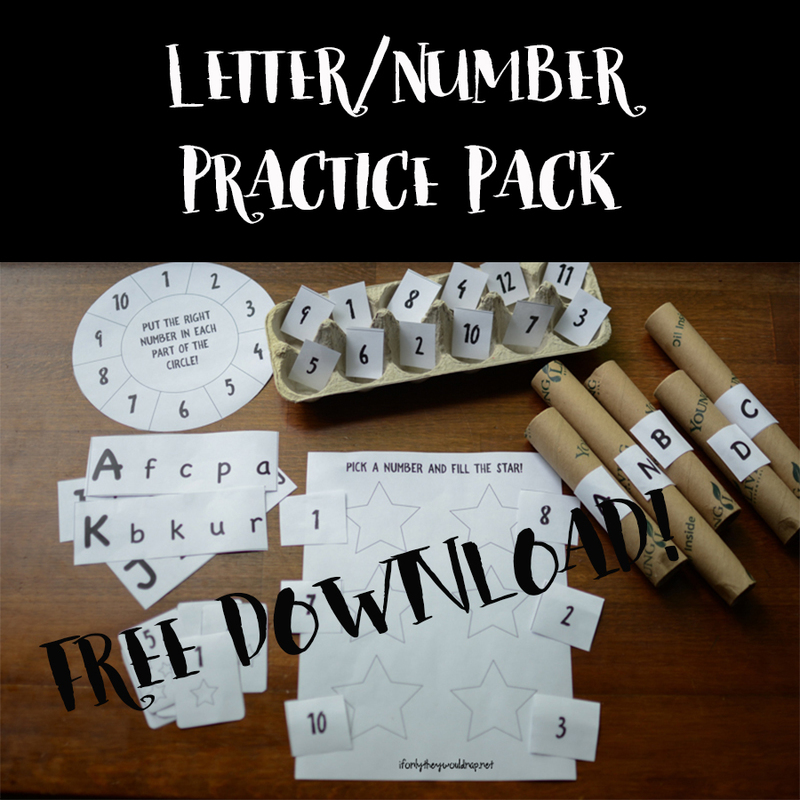 Letter/Number Practice Pack – FREE Download! The new school year is upon us! Whether you’re homeschoolers like us or your kids go off to school, there’s so much excitement wrapped up in the new school year! The teacher in me loves getting all the new supplies and curriculum. 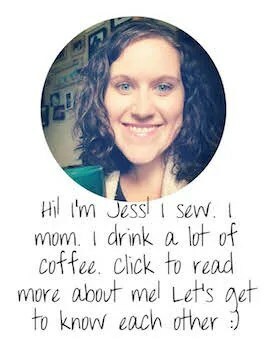 I’m kind of an eclectic homeschooler, in that we use a mix of a few things for our curriculum. This year my boys are in fourth, second, and first. Plus I have a preschooler and the baby (oy… he’s a whole post in itself!) We’re big fans of slow learning in the early years – I don’t push them to read before they’re ready, and we don’t do formal school until at least kindergarten. Because play IS learning for littles!! But sometimes my preschooler wants to “do school” like his big brothers, and my first grader could use some review. So I created this FREE download – a letter and number practice pack for preschoolers to first graders! Print it off and add a few materials that you already have on hand to give your kiddos some fun learning activities! There are six activities in this Practice Pack, though you could easily use the pieces to create even more! 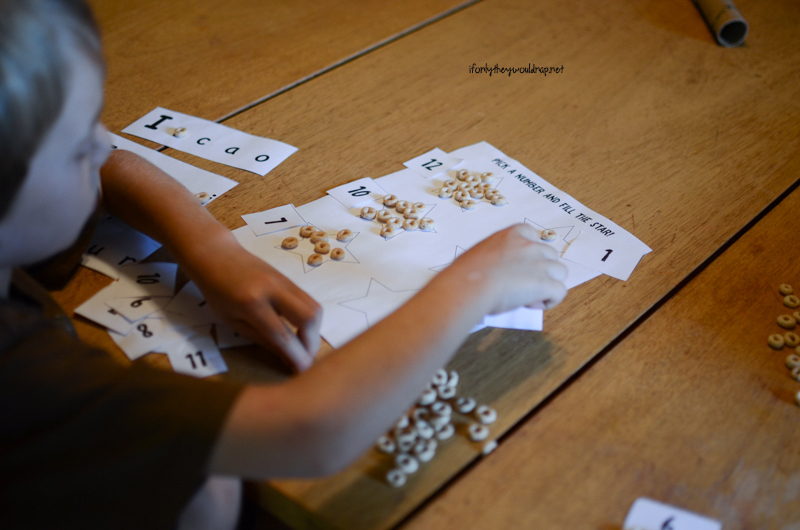 I made a variety of letter and number activities at varying levels. Some of them can be used more than one way depending on your little one’s needs. 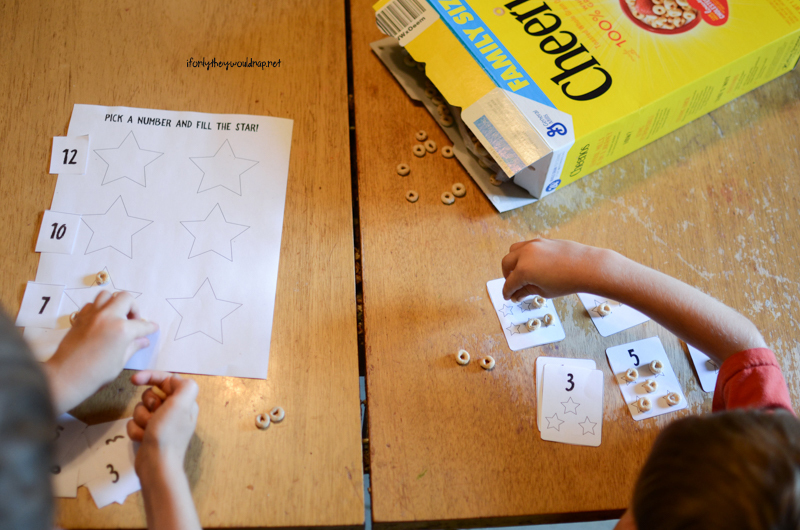 Have your kiddo count out the correct number of Cheerios to match the number of stars on each number card. Draw a number card (1-20 available). Your child will place the card next to a star and fill that star with the correct number of Cheerios. With so many kids and homeschooling them all, it’s important for me to have some learning activities they can do without a lot of direction. After I told them the instructions, they were able to do it all on their own! 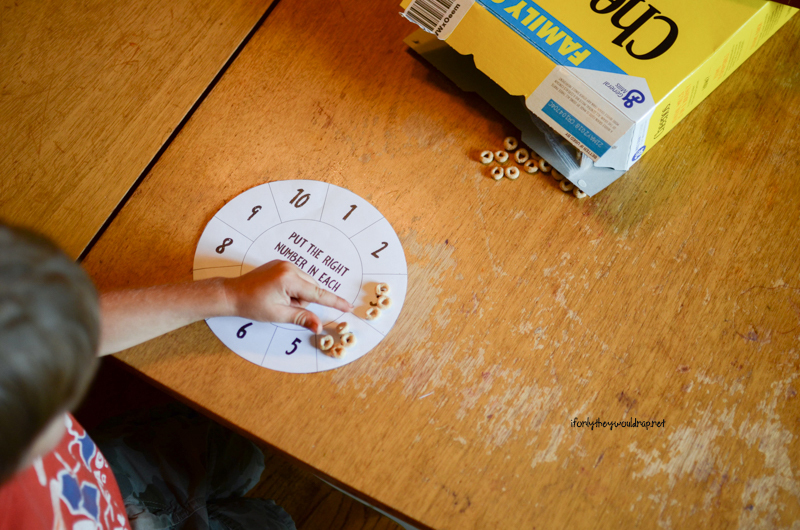 For this circle activity, your child will count out the correct number of Cheerios to match the numerals around the circle. Place number cards in each section of the egg carton. 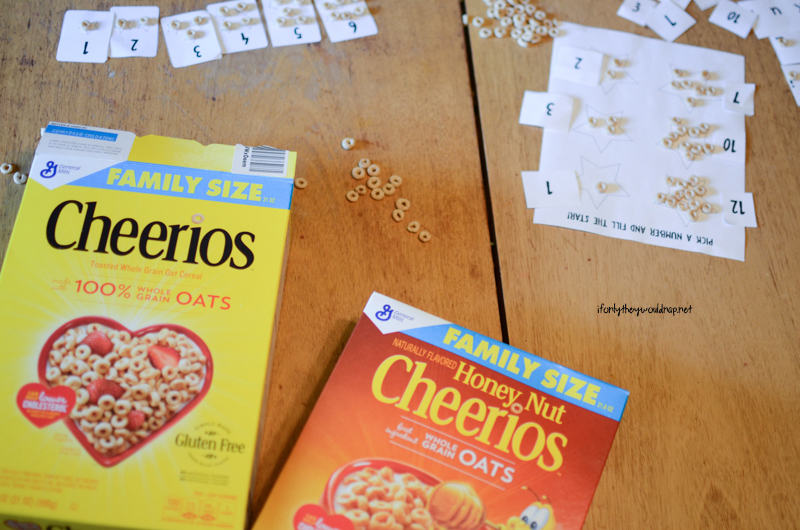 Have your little one count out the number of Cheerios to match the numeral. Cut the egg carton in half for kiddos who are just learning numbers, so that it’s not quite so overwhelming. This craft has a bunch of different activities you could do with it! 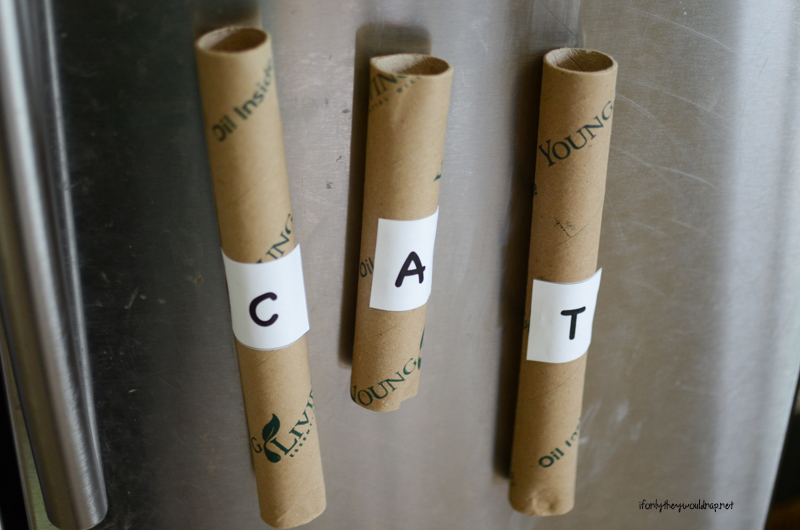 Put your magnet strips on the backs of your cardboard tubes. 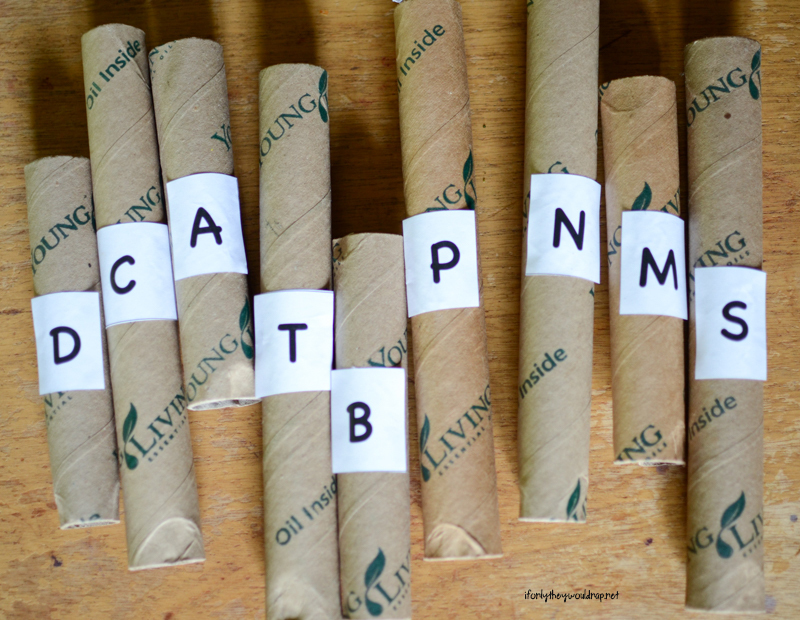 Glue upper or lowercase letter cards to the front of the tubes. 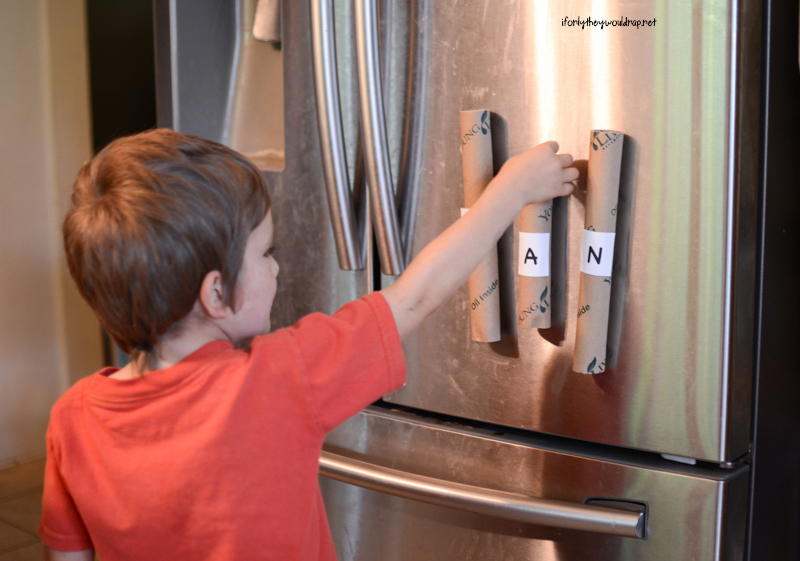 Put the letter tubes onto a magnetic surface like your fridge or a white board. Have your kiddo say the letter sound as they slide a Cheerio down the tube! If your little one doesn’t know letter sounds, focus on identifying letters. Ask them to slide a Cheerio down a certain letter tube. 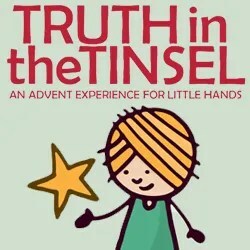 This is such a fun activity – ALL my kids liked it, even my almost ten year old! Because who doesn’t love shooting Cheerios down a tube?? ;) I love that I don’t have to worry about my 11 month old getting a hold of the Cheerios as they fall, unlike a marble or some other small manipulative. 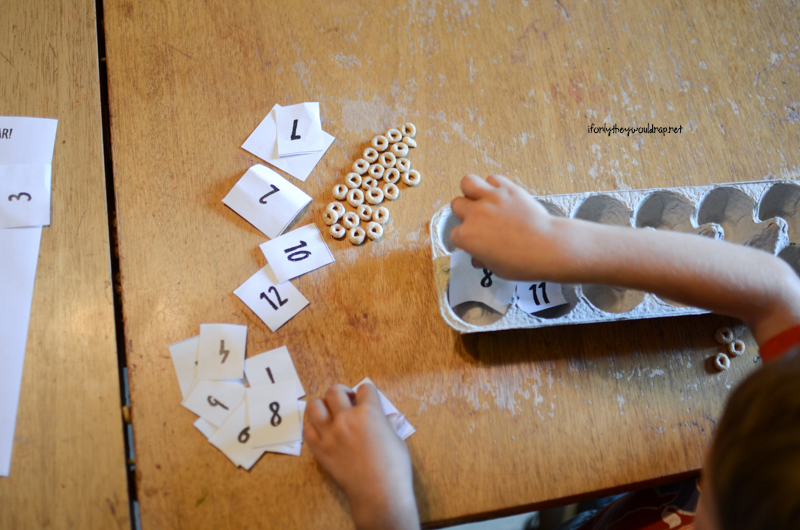 You could also print out another set of number cards and glue those onto the tubes if you want to focus on numbers. Then have them slide the correct number of Cheerios down the tubes! Within each letter strip, have your child find the lowercase letter that matches the uppercase letter at the beginning of the row. 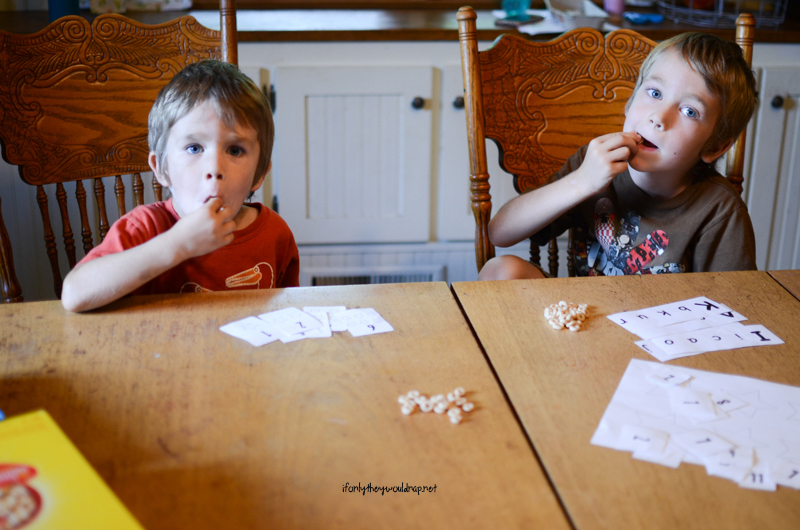 Whether you homeschool or not, these are easy activities to whip out on a moment’s notice with your kiddos. If your littles need a little extra help learning their letters and numbers or if you just need a few fun activities for them to do when they’re begging for some screen time, these are easy to pull out without a lot of prep. If you want your activities to last and be able to use them over and over, make sure you print or glue onto cardstock or get them laminated. I’m not even kidding when I say that my boys would eat cereal all day if I let them. Ha! 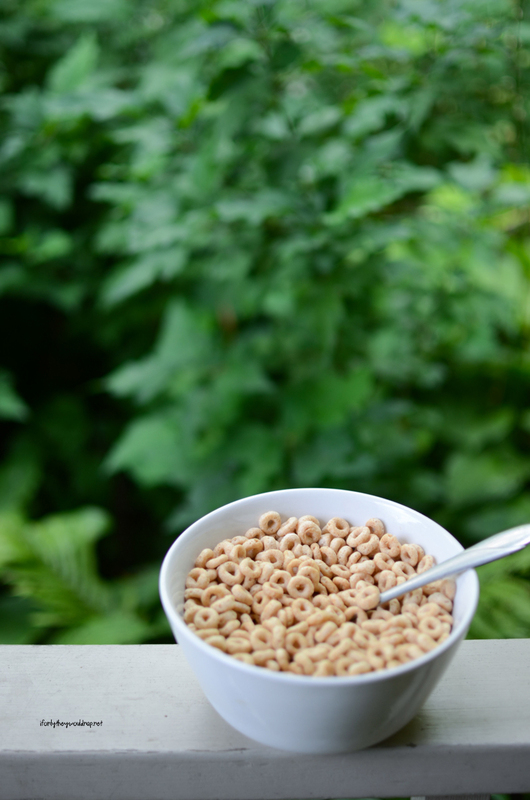 I really appreciate that Cheerios has no High Fructose Corn Syrup (one of the biggest no-no’s in our house), and I love that they’ve removed the preservative BHT from their cereals. When I was pregnant with my youngest, oh my goodness I craved Cheerios!! Unlike my kiddos, I’m not usually much of a cereal eater, but I think I have some childhood nostalgia around Cheerios, because I love a big bowl with bananas. So yummy! :) As we get back into our homeschool groove, having quick and easy breakfast options is important to me. We can toss them in a Ziplock bag for mornings when we need to leave the house early. Plus, can I get an Amen for Family Size boxes?? A total big family necessity! So grab your FREE DOWNLOAD of the Practice Pack, grab some Cheerios from any local retailer, and have a smooth transition into the new school year! 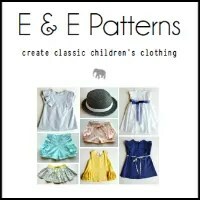 Previous postHiking With Kids: How to get started and what to bring! 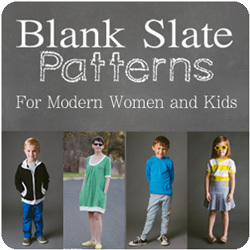 Next postFREE Raglan Cardigan Pattern and Cozy Layers for Fall! So much fun, open ended activities here! Love this! 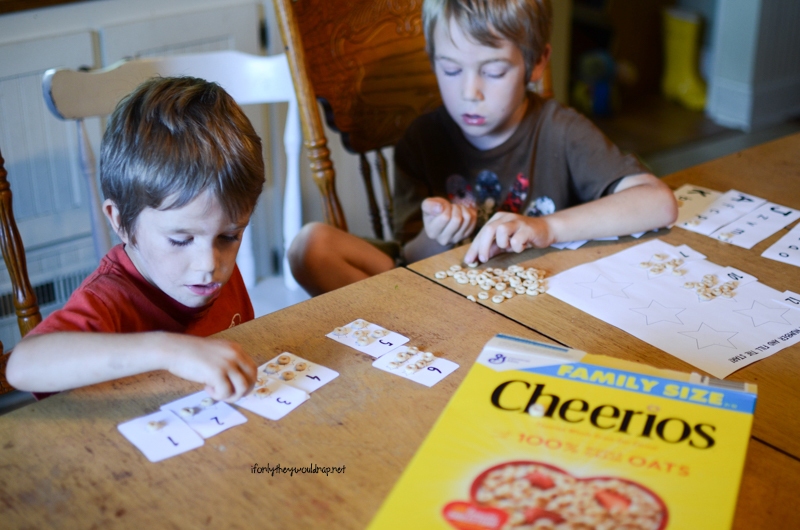 When my kiddos were younger, we used Cheerios all the time for learning. Great job! 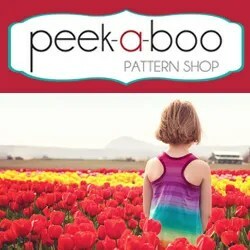 My preschooler would love this!